Benefitting from strong pharmacy sales in the US, earnings of drugstore chain Walgreens Boots (WBA) rose sharply and topped Wall Street estimates in the August quarter. Meanwhile, the company’s stock plunged in premarket trading Thursday after sales missed expectations, despite a 10% increase. Earnings, adjusted for non-recurring items, increased 13% year-over-year to $1.48 per share, far exceeding expectations. On a reported basis, profit nearly doubled to $1.5 billion or $1.55 per share from $0.8 billion or $0.76 per share in the same period last year. 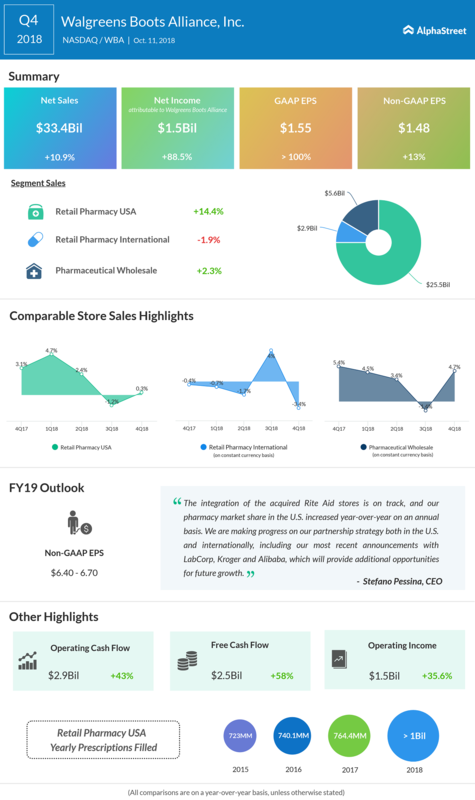 During the fourth quarter, sales climbed to $33.4 billion aided by a 14% increase in pharmacy sales in the US, especially in the Rite Aid stores. The top-line, however, slightly missed analysts’ forecast. Sales of Retail Pharmacy-International dropped 1.9%, while those of Pharmaceutical Wholesale rose 2.3% during the three-month period. “We are making progress on our partnership strategy both in the U.S. and internationally, including our most recent announcements with LabCorp, Kroger and Alibaba, which will provide additional opportunities for future growth,” said Walgreens CEO Stefano Pessina. In the whole of 2018, the management returned $6.8 billion to shareholders through stock repurchases and dividends. In fiscal 2019, adjusted earnings are expected to be in the range of $6.40 per share to $6.70 per share, at current exchange rates. At constant currency rates, earnings are seen rising between 7% and 12%. After acquiring about 50% of the Rite Aid pharmacy chain a few years ago, Walgreens expanded its footprint in the healthcare services sector significantly. New developments such as the proposed acquisition of Aetna (AET) by CVS Health (CVS) and Amazon’s (AMZN) entry into pharmacy business are expected to intensify competition in the sector in the coming months. Walgreens shares closed the previous trading session down 2% and dropped further in premarket trading Thursday after the earnings announcement.